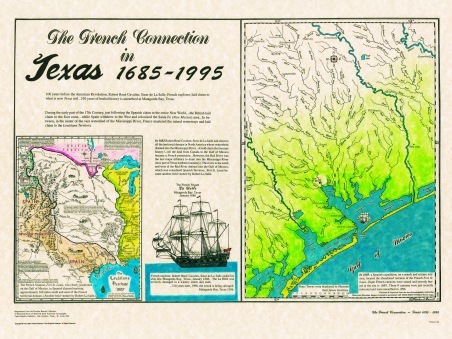 The Texana Series includes the following maps highlighting the creation of the 28th state: The Republic of Texas 1836, the 1845 Annexation of Texas and the Texas Statehood of 1850. March 6th, 1836 - The Mexican Army stormed The Alamo on the 13th day of the siege and killed the entire fighting force of valiant defenders. It was estimated that between 950 and 1,000 Mexican soldiers were slain during the 13 day siege. 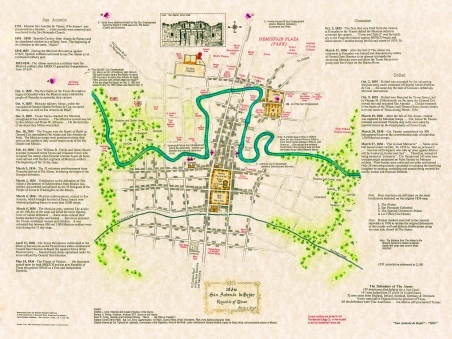 Also a map of San Antonio Texas in 1836, showing the locations of The Alamo, San Fernando Cathedral, and The Spanish Governor's Palace. 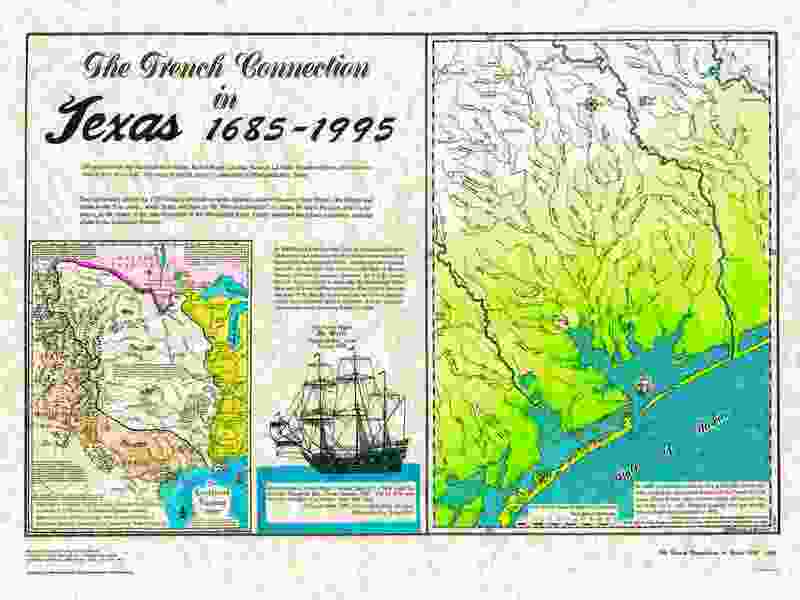 Included in the texana series the 1685 Robert LaSalle's shipwreck in Matagorda Bay. A map of the Robert LaSalle"s shipwreck in Matagorda Bay (Spanish Territory) which sank during a wintry storm in January of 1686, notes that the location is approx. 360 miles west of the French settlement of New Orleans. Was LaSalle really lost as he claims or was the French Fort St. Louis a bold encroachment of Spanish Territory? Guess we'll never know! 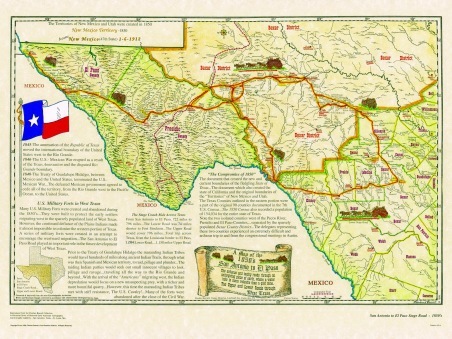 An 1850's map of the stage coach road from San Antonio to El Paso. The Upper Road went thru Fredericksburg, Fort Mason, Menardville and the ruins of the old San Saba Mission. The road then led to Fort McKavett and Fort Concho(San Angelo). The road then turned west to Horseshoe Crossing and on to Commanche Springs and Fort Stockton, where it joined the Lower Road. The Lower Road headed due west from San Antonio to Fort Inge(Uvalde), then on to Fort Clark(Brackettville). 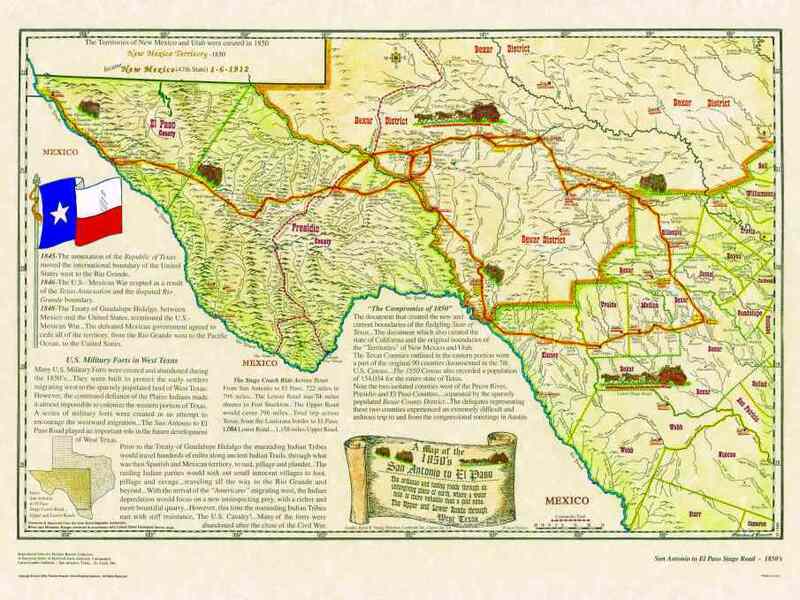 The road then headed for San Felipe Springs(Del Rio)and continued northwest to Fort Lancaster. The single route then angled thru the mountains to Fort Davis and on to Van Horn Wells. The road reached the Rio Grande at Fort Quitman and followed the river north to El Paso and Fort Bliss. San Antonio, Texas in 1836, with a population of about 2,100. The 4 areas colored in red and orange are the 4 original structures from 1836. The Alamo, San Fernando Cathedral, The Spanish Governor's Palce and the Cos House in La Villita. 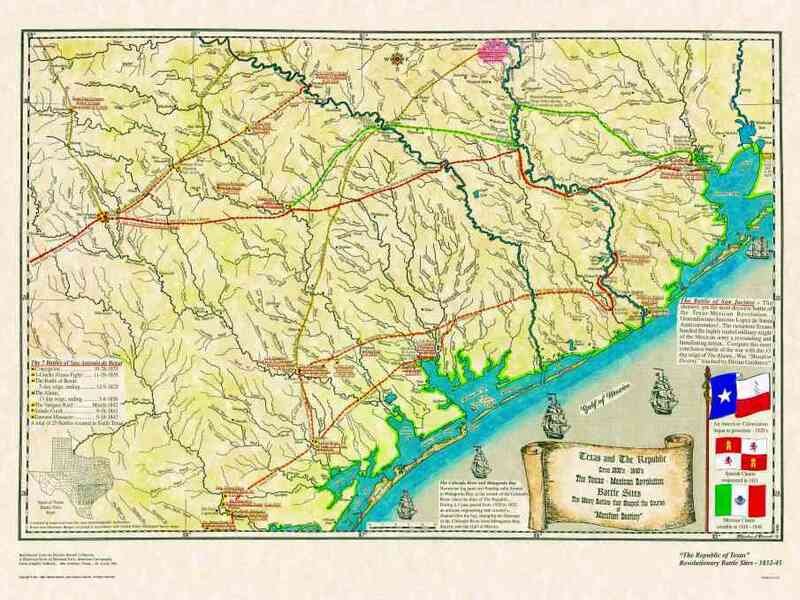 Note The Alamo on the east side of the river and the town of San Antonio on the west side of the San Antonio River. The Battle Sites of the Texas-Mexican War. The 7 battles that took place in San Antonio to include the 13 day seige of The Alamo, plus the 15 battle sites between San Antonio and San Jacinto. 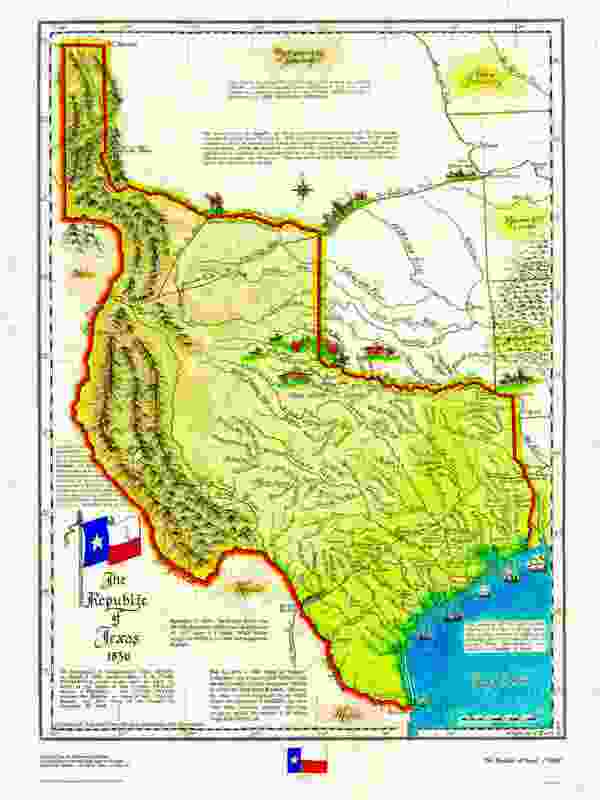 The final battle site and the resounding defeat of the highly touted military forces of Mexico at San Jacinto, giving birth to the new Republic of Texas. An 1836 map of The Republic of Texas. 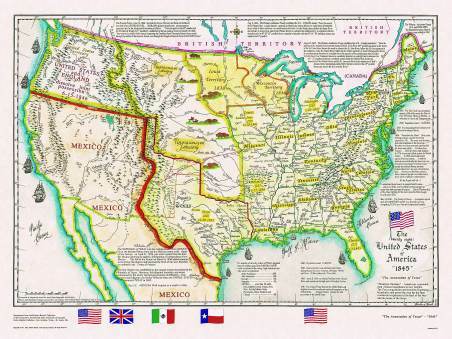 Note the eastern stairstep boundary outlining the Texas-U.S. boundary. This boundary was established by the "Adams-Onis Treaty" in 1819, by Spain and the United States. The western boundary, The Rio Grande, from its mouth to its source then north to the 42nd parallel. This separated Spanish Territory from the disputed Oregon Country. 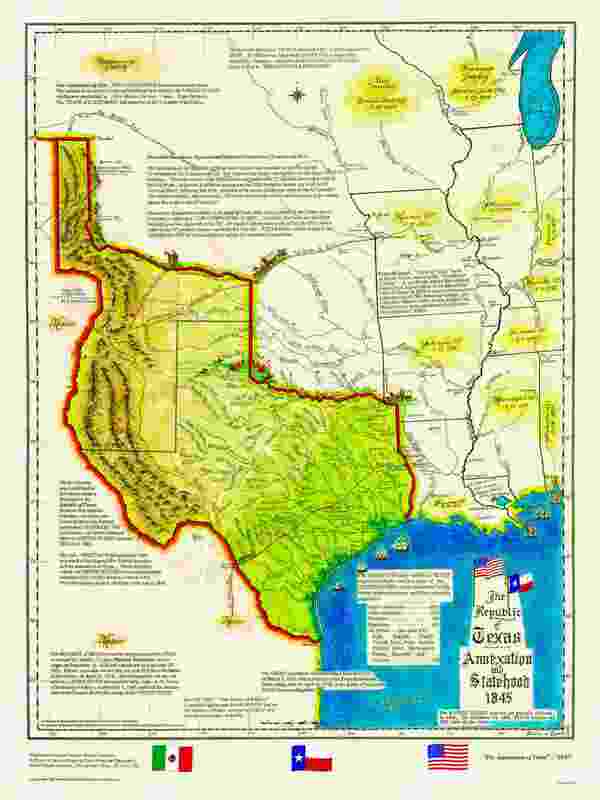 The State Flag of Texas is the oldest State flag in the contiguous Uninted States adopted in 1839. 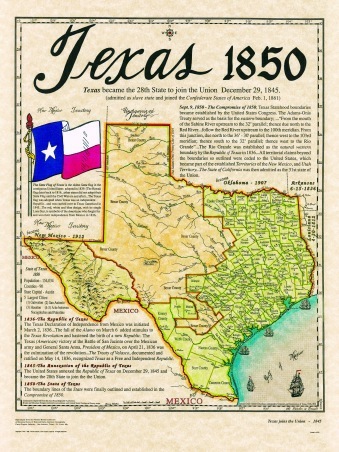 (Other states did not adopt their State flag until after the Civil War era) The Texas flag was adopted when Texas was an independent republic and was carried over to Texas Statehood in 1845. The red, white and blue design, with its single Lone Star, is symbolic of the Americans who fought for and won their independence from Mexico in 1836. 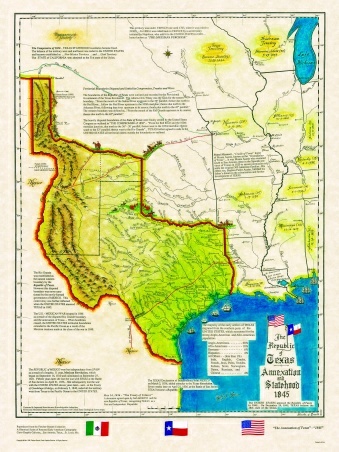 "The Republic of Texas" will exist for 10 years before being annexed into the United States. 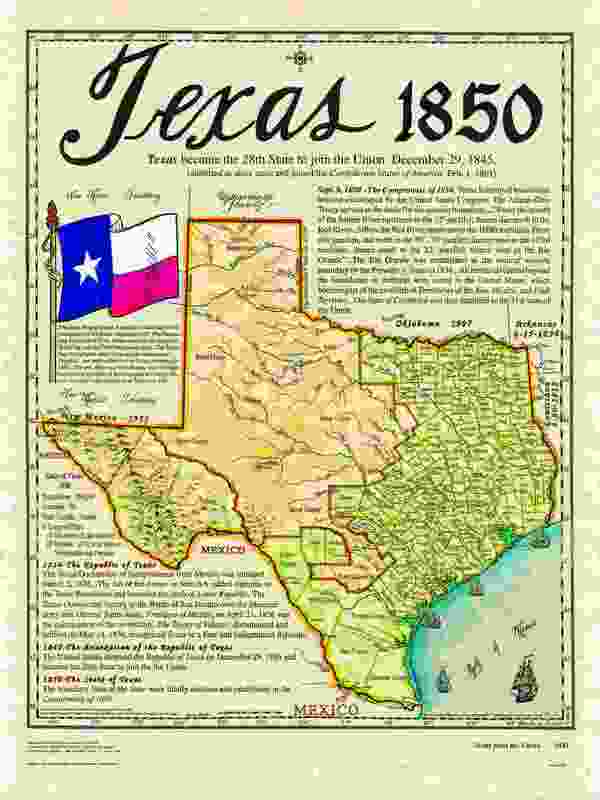 On New Year's eve 1845, the out-going President John Tyler signed the treaty which annexed the "Republic of Texas" into the United States. The ever changing governments of Mexico had continued to harass the people of the new "Republic" ever since the Texas victory at San Jacinto in April of 1836. 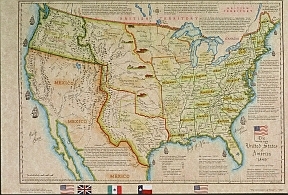 The annexation by the United States lit the fuse that led to the U.S.-Mexican War in 1846-1848. Now we can take a close look at the creation of our 28th State. 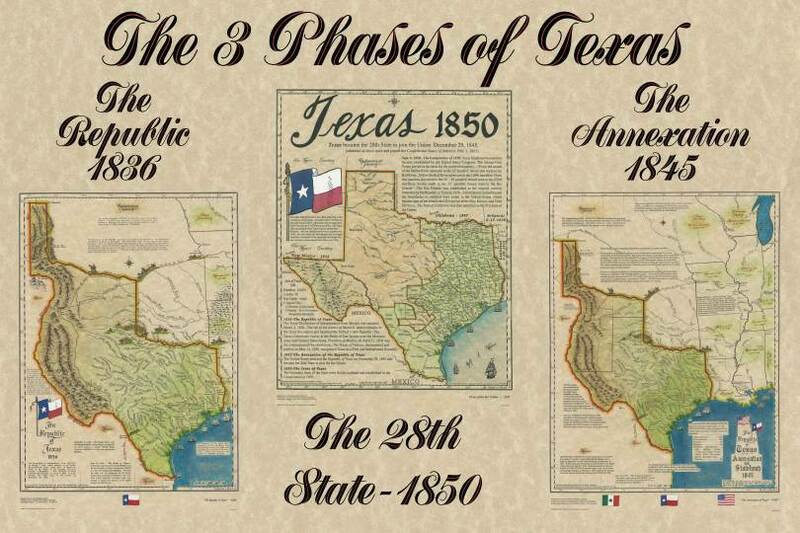 The Republic in 1836, The Annexation in 1845 and The Statehood 1850.